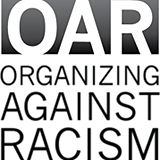 Organizing Against Racism (OAR) is a network of anti-racism groups and activities in and around the Triangle. OAR works to continue developing awareness about how racism lives in each of us and in our institutions, so that we may be strong, organized, and clear in our efforts to dismantle racism. One way OAR does this is by organizing anti-racism workshops led by the Racial Equity Institute (REI). With a clear understanding of how institutions and systems are producing unjust and inequitable outcomes, workshop participants are able to begin a journey to work toward social transformation and racial justice. Learn more and see when upcoming workshops will be held at www.oarnc.org. Contact Heather Ferguson with questions or to learn more.